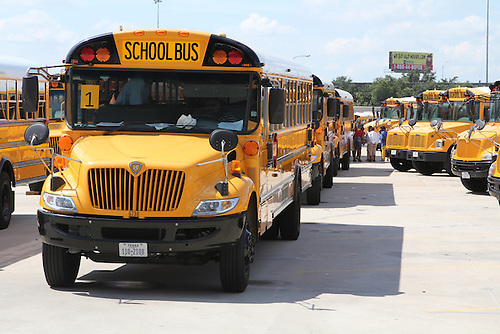 Government Fleet, a leading transportation industry magazine, has announced the top 100 fleets for 2013 and HISD is once again the only school district in the country to earn a spot on the list (not including Honorable Mentions). 2013 will mark the third consecutive year for HISD’s Transportation Services department to be on the list. In 2011, it ranked 57th in the nation among the best fleets in North America, and last year, it moved up five spots to number 52. This year, HISD broke into the top half of the list, with a ranking of number 47. Three other school districts received Honorable Mention this year, two of which were in Texas: Austin ISD (Hill Country) and Pharr-San Juan-Alamo ISD (Rio Grande Valley). Also earning Honorable Mention this year is Florida’s Orange County Public Schools. Representatives from HISD and the other Top 100 fleets will be formally recognized at the Government Fleet Expo and Conference in San Antonio, June 10–12. The top 20 fleets will also be formally announced at that time. HISD’s Transportation Department has also been recognized with the National Association of Fleet Administrators’ Excellence in Public Fleet Sustainability award (2013) and the Top 40 Green Fleets award (2011 and 2012). It was one of two finalists for what’s considered the “Oscar” of the public school transportation world, the Larson Quality Award from the National Association for Pupil Transportation (2012). In addition, HISD Senior Manager of Fleet Operations Mark Swackhamer was named by Green Fleet Magazine as one of the Sustainability All-Stars for 2012. This entry was posted in Achievement/Recognition, Transportation and tagged buses, HISD Transportation Services, Transportation Services on June 18, 2013 by HISD Communications.